Think CeMAT, think TOYOTA was the theme promoted by Toyota Material Handling for this year's event, reflecting a wide range of ideas and concepts that the company has developed for truck operators and logistics managers. Many of the concepts are available now, but some ideas also take a look at the future. 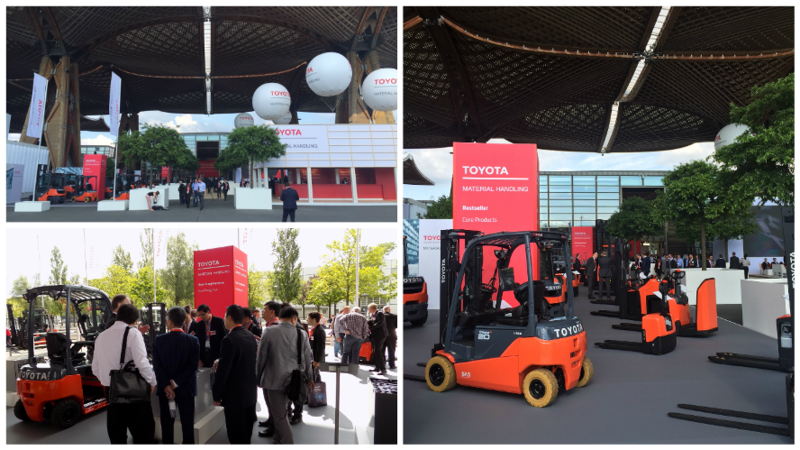 One of the key areas within Toyota's CeMAT presentations was a focus on energy systems. Two of the latest truck ranges launched by the company - the BT Staxio P-series stackers and the Toyota Traigo 48V counterbalanced trucks - were on display. Both of these trucks are available with lithium-ion battery systems, meaning that Toyota is now able to offer lithium-ion across its entire range of mainstream electric models, including reach trucks and order pickers. Other new energy systems presented included fuel cell technology (already in use with some of Toyota's European customers) and the latest IC-engines. The latter are notable due to their high fuel efficiency that is less affected by heavy driving styles - a factor that can ordinarily increase fuel consumption by up to 35%. At CeMAT 2014 Toyota presented its Smart Truck concept, based on the company's award-winning I_Site system, where trucks are connected on-line via standard telecommunication networks, transmitting data relating to truck and driver performance. At CeMAT 2016 Toyota presented further advancement in this concept - a special feature called the Smart Dynamics zone. Occupying a futuristic dome structure on the booth, the zone presented a wide range of benefits that logistics managers can derive from the use of smart trucks. These included advances in safety, operator performance, service improvements and energy management. Using data to improve truck utilisation based on flexible rental arrangements is another key development, as well as the concept of smart benchmarking, to assess and compare truck performance across different sites. Toyota has a proven track record and experience in designing and providing automated solutions, and several automated concepts were demonstrated at CeMAT this year. However the focus this time was on simplicity. Many of Toyota's customers are taking advantage of automation in selected areas of their operations, whilst retaining human control of other parts. That way system development and control can be based on the standard modules that are available from Toyota. This reduces time and cost, and resolves concerns relating to perceived complexity and risk that many truck users have had in the past. Toyota has for many years been associated with business management concepts, among which the well-known Toyota Production System - lean manufacturing processes that have been adopted by companies worldwide. At CeMAT 2016 Toyota presented an extract from their Toyota Tonero production line, showing the way that TPS is applied and the associated quality benefits. A particularly interesting feature at this year's event was future technology tour that showed a number of new approaches to material handling that Toyota is considering for the future. Visitors were invited to offer feedback on the tour to help with design development. The tour included a number of progressive concepts that included remote operation and active load carriers. CeMAT 2016 took place at Hannover Fairground, Hannover Germany between May 31st & June 03rd, 2016.